Are you in the military and going through a divorce? This is a highly stressful time for you, so do yourself a favor and hire an experienced lawyer who knows the issues that surround military divorce and take some of the stress off. Having an experienced attorney can help with the stress of divorce. With more than 20 years of legal experience, our St. Louis-based firm strives to provide detailed guidance to clients in Missouri and Illinois. Our staff strives to offer detailed advice you need to understand your various options. Contact us to schedule a free consultation to discuss your specific concerns and learn how we can be of assistance. 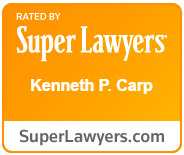 The attorneys at The Law Office of Kenneth P. Carp, PC know the rules regarding the military and divorce and gets those rules to work for you, with over twenty years of court experience our senior attorney Kenneth Carp, a retired Lt. Colonel with the US Air Force, has the right experience to represent you. Call (636) 947-3600 to schedule an appointment.